This time last week the only Ted Williams anyone had ever heard of was the baseball player. Then a reporter for the Columbus Dispatch, Doral Chenoweth III, posted a short clip on the internet on a slow news day and overnight Ted Williams went from homeless to a star with job offers reportedly coming from the Cleveland Cavaliers, Oprah Winfrey, Jack Nicholson, Kraft Foods, and many more. I don’t believe in blind coincidence. If things come together coincidentally, then I feel this is God’s signpost pointing us down the right path. And, there are so many things about this story that are coincidental. What drew the reporter and the homeless man together on that particular corner? Chenoweth claims he actually shot the clip a couple of weeks prior to posting it. Why did he hold onto the clip? If it had been posted before Christmas, it would, most likely, have been lost in the holiday shuffle. A slow news day at the start of a new year was a perfect time to place some “filler” on the newspaper’s web site. A feel-good human interest story will always attract some interest. So, let’s say the stars were aligned perfectly to look favorably down upon Ted Williams. However, Ted Williams, himself, played a large part in this scenario by being prepared at the right moment. He was not afraid to do a little self-promoting on his sign. 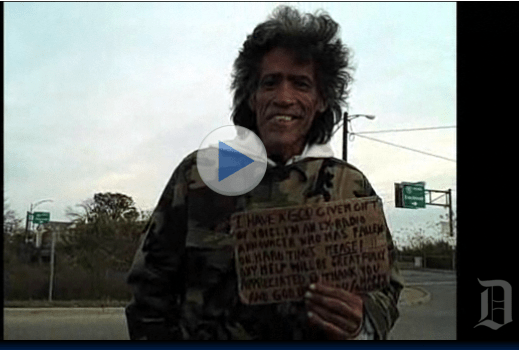 He proudly proclaimed on his sign that he had a God-given voice. There is that word again—God. In spite of all the suffering Ted Williams had gone through he still recognized that he had a special gift from God. When Chenoweth gave him the money and asked to hear his “God given voice” Williams not only launched into an impromptu audition but also thanked him for the opportunity and asked God to bless him. What kind of ex con and drug addict says something like that? One who was raised in a prayerful home. I have included links to several clips from the Columbus Dispatch video site. Be sure to watch the one of the reunion of Ted Williams with his mother. They both speak of their prayers over the years. I have developed a unique belief—one I have never read or heard of from any other source. I believe God has given each one of us a special talent. It is up to us to find and develop that talent and use it for good purposes. Sometimes it is difficult finding our talent but each person knows deep within himself what that talent is. Usually teachers, parents, or other counselors help us discover it during our youth. It is then up to us to nurture and grow our talent to the best of our abilities. And, it is never too late to develop that talent. Remember Grandma Moses who didn’t take up painting until she was in her seventies? I feel this talent is not only God-given but serves as our tie to our creator. Many times when I am writing I am deep in thought and concentration (or is it meditation) and when a piece is finished and I read it I often wonder where some of the words and phrasing came from. The opposite side of this belief is that if we abuse or neglect our talent then we will suffer in some way. It is sometimes, but not always, physical suffering such as Ted Williams has gone through but it may be in the form of a spiritual dryness. Putting all religious theories aside, it is wonderful Ted Williams got his second chance. He was prepared to take advantage of an opportunity when he saw it. However, now the hard work begins. Many problems often accompany overnight fame. Has he recovered from his drug and alcohol addictions enough to resist the temptations now before him? Sadly, I see in today’s news that he has already garnered negative press. It seems he and his daughter got into an argument loud enough to cause others in the hotel to call police. He also admitted that during the press whirlwind he was nervous and asked for a nerve pill. I am asking all of you to join me in sending prayers his way to encircle him with positive energies to enable him to resist temptations and live a rich and rewarding life now that he is on a new path. He is going to need the help of many. I hope he doesn’t blow it.